Obedience training .A Hands-On Guide to formalizing obedience commands for working retrievers.Step-by-Step instruction from the author of the Smartwork series with detailed video illustration of forcing techniques.Formalizing fundamental obedience commands, including e-collar conditioning to "Here", de-bolt, Heel, Sit, Kennel, etc. He is also a columnist for The Retriever Journal, and has trained and handled many dogs that earned positions on the National Derby List, including five in a single year; one of them being number three with seven wins. At least three of the dogs he trained as a professional became Field Champions. 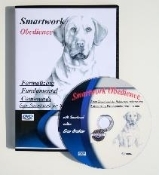 The driving force for his development of the Smartwork method was the belief that one can never know how good any dog is whose Basics were not thorough. As a portion of method refinement, he maintained a strong focus on efficient, effective Basics.